For each site on which you want to place ads you need to define one or more ad locations, referred to as Spots. A spot can show a single ad, or it can show up to three different ads, selected in rotation. Click the site you want to work with in the Sites tab. Click the New Spot button. 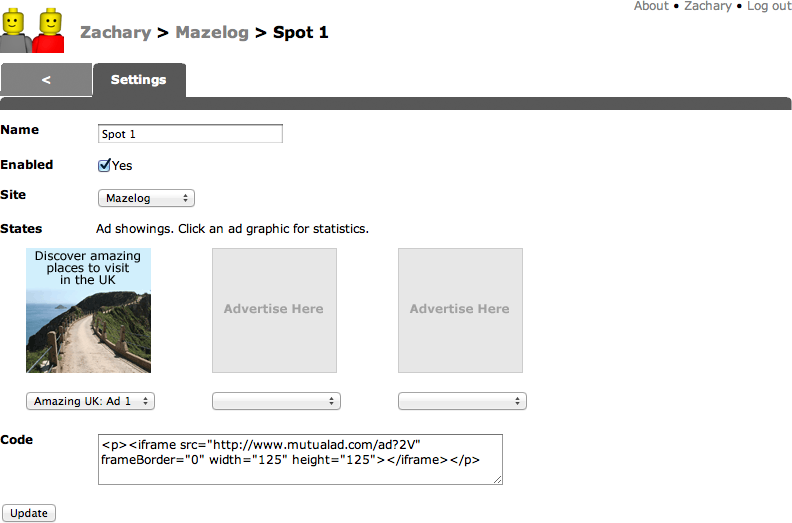 A new spot called Spot 1 is created, and the Settings tab lets you choose which ad or ads to show on the spots. Select an ad from the pop-up menu below the first spot state to choose what ad to show there. The pop-up menu will list all your ads, plus the ads from anyone you have listed as your associates. In a similar way you can up to two more ads to the spot. Cut and paste the code in the Code box. Insert it on your site to automatically publish the ad or ads.